See our website under the heading parties for more information. TEA SHIRT PAINTING PARTY Starting February we have a tea shirt painting and parade party Min. 8 children $299.00 +HST extra children $30.00ea. We supply table coverings, utencils, cups etc. You supply the snacks and drinks. 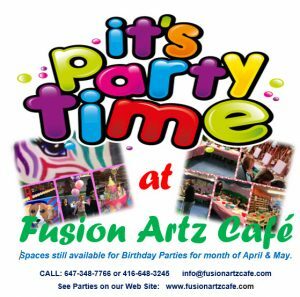 Guests would choose from items such as, PARTY ANIMALS, MUGS, BOWLS Extra guests will be charged $21.00 per item. THIS price includes glazing and kiln firing, table covers, plates, utensils, cups etc. Guests would choose from items such as, FLOWER PLATE, CONTEMPO MUG, GUITAR BOX, TILE BOX etc. Extra guests will be charged $25.00 per item, this includes glazing and kiln firing, table covers plates utensils, cups. Colour of your choice. Guests would choose items such as, ICECREAM CONES, DONUT BOX, FLOWER TRINKET BOX, etc. Extra guests will be charged $29.00 per item. This includes glazing and kiln firing, table covers, plates, utensils. Colour of your choice. CANVAS PAINTING (MINIMUM 8 Children or ADULTS) This is the new CANVAS PAINTING PARTY. An Artist will assist the children (or Adults) in the art of painting from beginning to the end. Guests will mould and paint a clay item, which will be glazed and fired in our kiln. extra guests charge will be $25.00 per item. You bring cakes, treats, We supply table coverings, utensils, plates & cups.